The Dobbin Group (thedobbingroup.com) has proposed a project titled "The Memorial Drive Brownstones" which proposes to rezone 13 lots west of the Kensington Inn to MC-2 and to amend the community's ARP to include that parcel in the ARP's "mid-rise low density" area. There is a round table discussion tonight,Thursday Aug 1 at 7pm at the Hillhurst-Sunnyside Community Association, in the Hearth Room. (1320 5 Avenue NW) regarding the proposal. 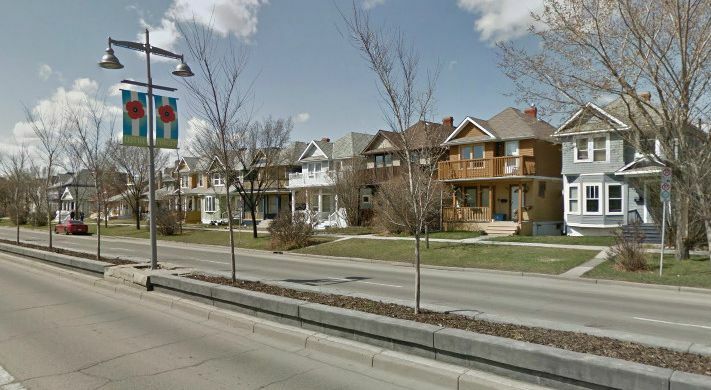 The 13 properties in question are all turn of the century houses, but have not been evaluated for inclusion on the City of Calgary's Inventory of Historic Resources. News article with comments by CHI president Cynthia Klaassen and Lorna Cordeiro of the Century Homes Calgary project. Photos also at the link. Watch for a story on CBC tv news this evening, August 9. Cynthia Klaassen, president of the Calgary Heritage Initiative Society, stands in front of a line of heritage homes on Memorial Drive that are threatened with demolition for a condo project. A unique collection of century-old, heritage homes could be levelled to make way for a new condo development along Memorial Drive, just west of the Louise Bridge. Dobbin Group developers have made an application to rezone a strip of 13 properties between 1134 and 1160 Memorial Drive N.W. to make way for a 70-unit development of Chicago-style brownstones. Residents in the area are worried the heavier use would result in more traffic on an already busy street that shares a backlane with a hotel and several commercial properties along Kensington Crescent, including a theatre and restaurants that have frequent backdoor deliveries. But Cynthia Klaassen, president of the Calgary Heritage Initiative Society, said demolishing this particular group of century-old homes would be a huge loss, particularly since many have been so well-maintained for years. “All of these homes are over 100 years old,” said Klaassen, whose group is dedicated to the preservation of historic buildings and sites in Calgary. “And if you get rid of them, the community becomes like any other. Lorna Cordeiro, a community resident and member of the Hillhurst-Sunnyside heritage task force, added that the Edwardian-style homes bring an important diversity and unique flavour to the community’s architecture. Jennifer Dobbin, spokeswoman for the project, said the new Chicago-style brownstones will have a lot of character, and will better support the community’s new transit-oriented redevelopment plan. She argues it’s better to maintain heritage homes on the inside of the community, as opposed to the outer edge along such a busy east-west traffic route. The development, called Memorial Drive Brownstones, proposes 70 units within a three to four storey complex, a 96-stall underground parkade, a central courtyard, and rooftop patios. Residents at a community roundtable discussion about the project last week voiced several concerns over the additional traffic volume such a development could bring. The alleyway is already heavily-used by commercial vehicles, and residents of the new complex may have to battle those vehicles to share the lane. But Dobbin is proposing additional access points halfway through the complex off Memorial Drive westbound. To ease congestion, residents could turn right into the complex off Memorial Drive westbound, loop through the complex, then turn right to exit back onto Memorial. Tim Kitchen, board chairman for the Hillhurst-Sunnyside Community Association, said he supports higher density in the area to support transit and prevent urban sprawl. But he, too, wonders whether increased traffic at this location, particularly through the alleyway, will benefit the area. Dobbin said that’s why she hopes the development can act as a buffer between heavy traffic and the community. Units along Memorial Drive would face north instead of south, into a quieter courtyard area. But Cordeiro argues a vital component to the new transit-oriented, area redevelopment plan is missing — formalizing a process to maintain heritage homes. “Our entire community is now under siege,” he said. Klaassen explained the homes along Memorial Drive’s 1100 block have never been designated as heritage properties because owners are often afraid of the many rebuilding and renovation restrictions that are placed on them. The community itself, though, boasts a rich history. According to the community’s website, a wave of settlers arrived in Hillhurst-Sunnyside in the early 1900s, some setting up homesteads along the road that is now 10th street, while others farmed at Riley Park and open lands west of 14th Street. The community was also home to many who worked for the CPR and the Eau Claire sawmill just across the Bow River. Residents kept chickens, tended to vegetable gardens, and weathered regular floods from the south and occasional mud slides from the north.